Today was the first official day with all FMPSD (Fort McMurray Public School District) staff! The day started off with a meet and greet, staff gathered in the lobby at Keyano, nibbled on some fresh fruits, or a muffin and caught up with co-workers. Once everyone was seated in the theater, the day began. ATA president, Nancy Ball, put on a good act with not knowing where Mr Meagher was, once on stage it became apparent that he was dealing with some issues with Uno, his dog. 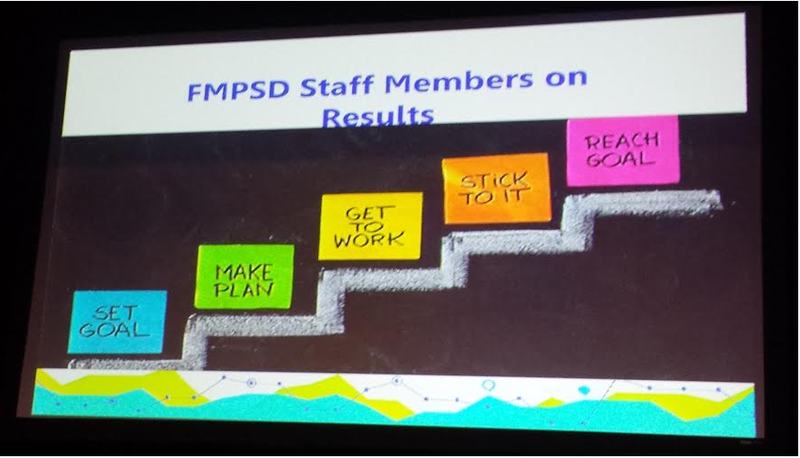 FMPSD’s leadership teams brought forward three areas of focus for the upcoming school year; Student Achievement, Environmental Stewardship, and Healthy Schools. We listened to Mr. Doug Nicholls, Superintendent of FMPSD, while he shared some data on student, staff and school achievements. He managed to get the room thinking about setting personal goals for the upcoming year. Another area of focus was Environmental Stewardship. Erin Keca and Nazia Hiscock gave an amazing presentation which showcased successes from our schools in their goals to make the planet greener. Students teaching each other all about composting, growing green spaces on school property, the importance of recycling and all the leadership roles that students are encouraged to take on was a delight to see. Their passion was infectious. FMPSD is the first district in Alberta to have a policy to support healthy eating, physical activity and positive well-being within the school community. There are several support systems for students and staff for mental well-being. As many of us have heard before, it takes a village to raise a child. Good health habits start at home.